Charles Stewart : Surf-riding at Lahaina, Maui, 1824.
during the Years 1823, 1924 and 1825. C.S. Stewart (U.S.N.) was an early Christian Missionary to the Sandwich Islands. It is possible that Stewart may have been aware of Lt. King's reports, first published in 1784. He was certainly aware ot the work of fellow missionary, Rev. William Ellis. 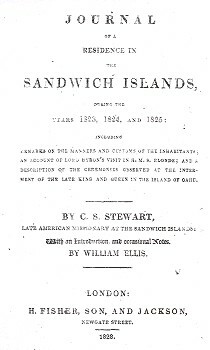 Ellis' Polynesian Researches, including an account of surfriding was published by the same London publisher in 1831. The two accounts have some similarities, see Ellis (1831). Stewart's work includes an account in Chapter XI of A Visit to Mr. and Mrs. Ellis, Pages 232-233? At Hilo, Stewart possibly met David Malo, page 301 (1829). "It is yet scarce twenty years since the American churces first projected the enterprise of introducing the blessings of Christianty and civilization to that people - then a nation of open and gross idolators, degraded not only by all the pollutions of paganism, but doubly cursed with vices and scourges of destruction, imported and widely spread through the population by dissolute and reckless visiters from Europe and America." The account is a specifically dated journal entry that from the context appears to imply a coastal residence and that the writer is aware of the value of suitable surf-riding conditions. It is probable that the notes are the combined analysis from a number of observations of surf-riding in various conditions. A brief, but detailed, account of surf-riding that is notable for the reported board lengths (8ft to 10ft), the early observation that the board's are highly polished and a estimation of the wave heights ridden by native Hawaiians. The report of surf-riding wave heights is possibly unique in the early literature and bears serious consideration. Finney and Houston (1999) note four located (and two unlocated) ancient surf breaks at Lahaina, Maui, page 30. "The surf for some days past has been uncommonly heavy, affording a fine opportunity to the islanders for the enjoyment of their favorite sport of the surf-board. With this plank under the arm, they leave the shore, and wade or swim into the surf. On meeting a roller, they dive under it with their board, to prevent being carried back by its power; and thus make their way beyond the reef to the smooth surface of the sea, -at Lahaina, a quarter of a mile from the beach. They then wait the approach of a heavy wave, place themselves at full length flat upon the board, with the face downward and the head and chest elevated above the forward end, headed for the shore. In this attitude they take the breaker, mount upon its crest as it towers above the reef, and with the arms and feet skillfully keep their poise in the swell, so as not to be sufficiently forward to be overwhelmed by its combing, nor so far behind as to lose its impetus; and are thus hurried, with the velocity of a racer, on the rolling summit, their erected heads only appearing above the foam (3) until they are cast on the beach, or slip from the board in time to escape striking upon the sand. They then make their way out again, and return in the same manner. Another pastime of the natives, where a spot of ground adapted to it can be found, is the 'tropical counterpart of a winter sport' of boys in our own country, that of 'sliding down-hill on a sled'. The smooth sward of a suitable declivity is made to answer, in a good degree, the advantages of ice or snow, for this purpose; and throwing themselves forcibly, at the proper place, in the manner of boys in America, upon a long narrow sledge, having light and highly polished runners, with their brests pressing on the forepart, they often succeed in making a descent of one or two hundred yards at a single slide". 1. "The surf for some days past has been uncommonly heavy, ... the more terrific the surf, the more delightful the pastime to those skilled in the management of the board." Stewart notes the challenge of extreme conditions, as initially noted by Lt. King (1779 - edited 1784). He also, more dramatically, attempts to give a numerical estimation of the conditions, see (5) below. 2. "... a plank of light wood, eight or ten feet long, two feet broad, and three or four inches thick in the middle, decreasing to a sharp edge at the sides and ends, which are rounded, and having the whole surface finely polished; "
A brief but explicit description of the board dimensions and features, the length is in the mid range of other reported dimensions. Given the substantial difference in the respective page numbers (page 255 in 1828, page 196 in the 1829 and 1939 editions), this is possibly not the only text deleted from later editions. Note that these reports are all from different locations and different surf conditions, an so direct comparison of dimensions may not be valid. "light wood" probably indicates Wili Wili or Breadfruit.
" ... about six feet in length, 16 inches in breadth at one end and about nine at the other; and is four or five inches thick, in the middle tapering down." " ... five or six feet long, and rather more than a foot wide, sometimes flat, but more frequently slightly convex on both sides. " "... a thick plank twelve or fifteen feet long and perhaps thirty inches wide ... made from the trunk of a bread-fruit tree." Stewart's dimensions are within the range of other early accounts and correspond with examples held in contemporary collections. 3. "their erected heads only appearing above the foam"
Probably indicates that the riders were prone. 4. "Hundreds at a time have been occupied in this way for hours together"
Surf-riding in Maui circa 1820 is, according to Stewart, well patronised. Regrettably, James Jarvis reported that by the 1840's "... surfing was already a rare sight at Lahaina." Jarves, James Jackson (1818-1888) : Scenes and scenery in the Sandwich Islands, and a trip through Central America : being orbservations, from my note-book during the years 1837-1842. J. Munroe & Co., Boston. Edward Moxon, London. 1884. Page. 298. De Vaga (ed, 2004) Page 20. 5. "while the waves are breaking on the reef apparently twenty or thirty feet high"
The comment appears to infer that this is the size of the waves ridden. It is, possibly, the first attempt by a western observer to estimate the wave height. (Note that surfresearch.com.au wave height calculations are by the Willard Bascom Method , circa 1945). The abilty and success of ancient (pre-1800) Hawaiian surfers to ride large surf has been speculated on by some modern commentators. Given the performance of contemporary Boogie board riders in extreme surf conditions, there appears no reason to reject the possibility that similar feats in large, hollow waves were accomplished by skilled Ancient Hawaiian prone surf-riders. The arrival of clean big surf is rare occurance, even in Hawaii, certainly for Waikiki. "Zero Break" runs three days each year. "Zero Break" is the "beach" name for the largest waves that run. They usually occur when earthquakes of extreme consequence are recorded in the Pacific ocean, be it in California or Japan. Consider an hierarchical maritime culture that puts great value on surf-riding performance and great effort and resources into constructing surf-boards. Assume you are of the royal house, you posses a large expensive surfboard, the waves are the largest of the season and you refrain from displaying your prowess. There is a distinct possibility that, sometime in the future, your royal position may be called into question. 6. "Riding upon the surf, in a canoe in a similar manner, is also a common and favorite amusement." There are many accounts that report the skill of rurning to the beach through the surf by native boatmen, but here Stewart indictes that Hawaiian canoe surfriding is a recreational activity. Detailing the Years 1823, 1824 and 1825.
of the late King and Queen in the Island Of Oahu. Late American Missionary at the Sandwich Islands. Title page: Mitchell Library, Sydney. Weeks, Jordan & Co Boston 1839. Enlarged and.including an introduction and notes by William Ellis. Chapter X, Sports of the Surf, Pages 196 to 197. CASCADES OF WAILUKU. Tuesday,14th (June 1826). After satisfying our curiosity here, we rowed down the creek and across the bay, to another stream on the western side of the harbor, called Wailuku ---river of destruction, ---where the ships get their water. The entrance to this river is bightly romantic and beautiful, the banks being precipitous and rocky, and covered with a variety of vegetation. About a hundred yards above the beach, it opens into a still deep basin, encircled by high cliffs. Into this basin the whole stream is projected by two cascades, the upper about twenty feet, and the lower about eight feet, both rushing over their respective ledges of rock in unbroken sheets. A rude bridge crosses the stream just above the falls; and it is a favorite amusement of the natives to plunge from it, or from the adjoining rocks, into the rapids, and pass headforemost over both falls, into the lower basin. Some of them were engaged in this sport when we arrived, for the gratification of lieutenants Keith, Talbot, and Gambier, whom we found there. The accession of our party collected a greater crowd, and the cliffs and rocks were quickly covered with men, women, and children, many of whom not only passed ever the falls in the mariner described, but jumped also from a height of thirty, forty, and fifty feet, into the basin, which, though small, is of very great depth. Chapter 10, Sports of the Surf, Pages 196 to 197. Geoff Cater (2006) : Charles Stewart : Surf-riding at Lahaina, Maui, 1824.